Some thoughts as I head into my 80th year. I’ve often heard it said that when you reach my age, you have earned the right to speak your mind, so I’m going to take advantage of my position as an elder of the human community and do just that. I know, too, that some readers will be offended by my thoughts. They have that right, and they have the right to respond. I’ve been thinking about who we are and how we got to be who we are. Why is our planet in such turmoil? Why are we always at war? Why can’t Johnny read? Why do people die without healthcare? Why is anyone going hungry? And, why do we insist on killing or maiming each other? I have many more questions, but those few can sure cause the gray matter to begin working. What you are about to read amounts to a series of random thoughts from an old guy with too much time on his hands. A guy who has lived through 12 presidents and I’ve lost track of the number of wars. I find the state of our world deeply disturbing, so here’s my take on why I think we are where we are. The human race is a product of its environment. Like it or not we reflect, for the most part, the influence of our parents, family, early acquaintances, teachers, and childhood friends. That influence is very powerful. Some people can reject it and find new values, but they are in a very small minority, and rejection is not always right. The hatefulness and the goodness we see today are a direct result of our formative years. Hate and love are the two most powerful emotions we have, and they are learned behaviors. We learn from our families who teach us their values which are often based on what they learned in Sunday School or other religious-based education. Unfortunately, hate is often couched in terms of God’s love, and many, like neo-Nazis, sincerely believe they are doing God’s work. But — let’s be practical. Consider this. If a skilled, trained, highly experienced reporter covers a story and people think he or she was in error, how accurate can a story be that is covered by thousands of unknown, untrained, often illiterate people over a period of 2 or 3 thousand years in several different languages? Most of it was written down after years of storytelling. How did the Greek, Latin and, Aramaic languages survive translation without losing even the tiniest bit of accuracy, and then what happened when the words got translated into German and then English? Experts say there have been as many as 350 separate translations of the Bible into English alone since the end of the fourteenth century. Are we to believe that every translator interpreted every word, phrase, and passage in exactly the same way? But…here’s the Old English version from which it came. Again, I’m not disparaging religion I’m trying to be practical. My logical, journalistic mind cannot accept that nothing is lost in translation. It makes no sense. All of these stories have gone from language to language so many times it is virtually impossible to vouch for their accuracy. The many holy books, while filled with great ideas and inspirational stories, bear great similarity to the parlor game called “telephone.” You whisper a simple phrase to a person next to you, who repeats it to the person next to him and by the time the phrase has made its way through a dozen people it no longer remotely resembles the original language. Now, if you further complicate that situation by using a different language each time and then offer the next person a translation of what was heard you can see how easy it is to innocently but completely misrepresent even the best of holy thoughts. Our parents and their parents and the ones before them were all heavily influenced by religion. But, to be fair, the telephone game is a pretty sound example of why religion must be based on faith, there is too little, real, provable fact to approach it any other way. We probably can say with some certainty that Christ, David, Muhammad, Buddha, and others really did walk the face of the earth. It is the stories that tie their lives and deeds together that are suspect. But, if they make you feel good and cause you to do the right thing, then I do not argue with what you believe. Of course then, one must ask what the right thing is. There’s ample evidence of societies committing incredible atrocities while claiming it was the right thing to do. I am not saying religion is bad. Most of it starts out to be good. Humans being humans, though, had taken pieces of the great faiths and applied them out of context to support ideas the founders of the religions probably did not intend, although it is hard to know exactly what the intent was when little of that kind of evidence was written. The result of religious confusion is often mass hypocrisy. That fact alone may bear the greatest responsibility for the shape of our planet. Religious influence is everywhere. Throughout the world, almost every government has in its laws or constitution, the influence of religion. It is the foundation upon which our way of life has been constructed. Some of it is good, much of it very bad. History has taught us quite well that the combination of government and religion (a Theocracy) is an unholy alliance. Iran is a good example, but there are scores of others as well. Religion has a place, but not in issuing enforceable rules on how people should live their lives and who or what they should worship. The United States was founded on the belief that people should be free to practice or not practice their religion. The pilgrims arrived here because they did not have that freedom in their native land. 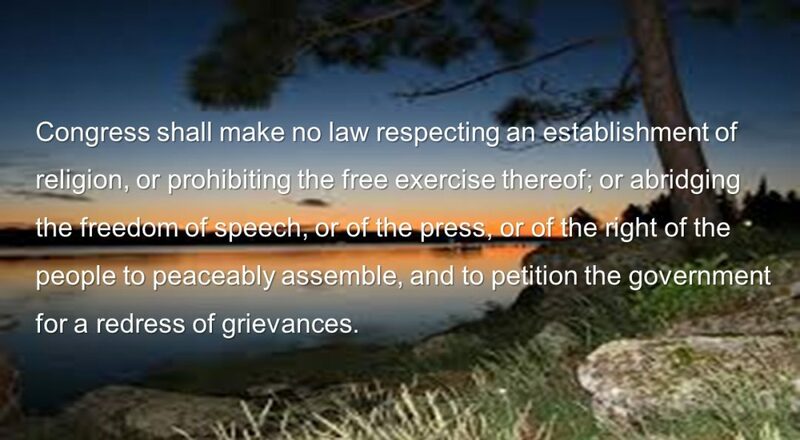 The founding fathers were clear when in the First Amendment to the U.S. Constitution they said, “Congress shall make no law respecting an establishment of religion or prohibiting the free exercise, thereof……” That means any law that would force people to belong to a specific religion or deprive them of the right to choose would be illegal. That’s as it should be. There are ten items in the Bill of Rights. All ten tell the government what it cannot do. So, if you were curious enough to read this to the end, I hope you learned something. If it upsets you. please present a factual, objective argument. And, if you just find it interesting, share it. No permission needed. And, from where I sit, that’s the truth. Posted in Religion in Society.Tagged Aramaic, first amendment, government, Greek, Human race, Latin, products of our environment, religion, translating the bible. An example I like on the fallibility of religion is that Christian preachers in the North and the South each showed how God was on the side of a) slavery, or b) antislavery. Take your choice.